Adding a Gold Seal uPVC door to your home gives the ideal first impression you want people to have about your home. A stylish entrance door is a key feature in any home and goes a long way to forming an integral part of the overall design and style of your home. If you prefer a more contemporary style, Gold Seal’s patio doors give you an uninterrupted and stylishly framed view of the garden beyond. By allowing natural light to flood into your room, a Gold Seal Sliding patio door offers a perfect vantage point for a great view of your garden, patio or decking area. Gold Seal can help you bring the outside in with Bi-Fold Doors – blur the lines between where your home ends and your garden begins to create a unique living space that is as versatile as it is beautiful. the doors sit inside or outside the property when folded back. Composite doors are rapidly becoming the preferred choice of exterior doors for many people due to the major advantages that Composite doors have over the alternative wooden doors, steel doors and UPVC doors. 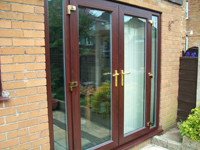 "Goldseal Homecare, Professional Installer Of uPVC Double Glazed Residential Doors."